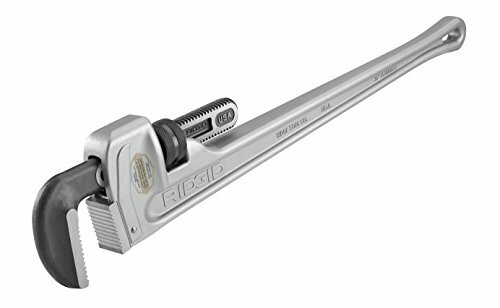 A practical addition to your toolbox, the RIDGID 31110 Model 836 Straight 36-Inch Aluminum Pipe Wrench is a plumbing wrench that delivers professional strength and reliability in a convenient, lightweight design. Nearly 40 percent lighter than comparable iron models, it provides the exceptional durability and ease-of-use that all RIDGID heavy-duty wrenches are known for. The aluminum pipe wrench has a sturdy I-beam handle with quickly adjustable full floating forged hook jaw. The jaw features self-cleaning threads and easily replaceable spring assembly, hook jaw and heel jaw for long tool life. A non-stick adjustment nut cleans away grime from the hook jaw shank for dependable tool use. This 36-inch straight pipe wrench is ideal for pipe diameters of 2 inch to 3-1/2 inch with a capacity of up to 5 inches, and is suitable for all forms of pipe work.